Are authors special? Not anymore than anyone else. They are normal people with hopes and fears and joys and heartaches. However, because of their art they are often put in a position of influence. We love certain authors because of the words they created, the stories they shared, the difference they made in our lives. I have authors that have changed my life. I look up to them. I’m grateful for them and will forever hold a special place in my heart for them. Whenever someone is in a position of influence they have a choice how they’ll use that. Some stand on a pedestal and puff themselves up. Others use their voice to lift others. One author touched my life is Michael Bond. 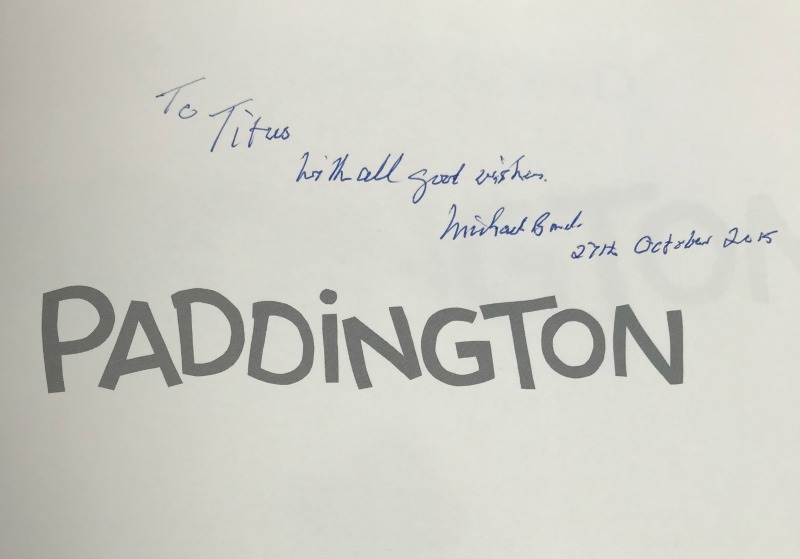 In fact, you could say i have a lasting bond with Michael Bond (pun intended). My son celebrated his fourth birthday the summer of 2015. He wanted a Paddington birthday party. It was magical (everything with four year olds is). Two weeks later we almost lost him to an adrenal crisis (which led to a diagnosis of Adrenoleukodystrophy). He was still very obsessed with Paddington at the time. I remember curling up with my sick boy and reading him Paddington. In his arms was the new Paddington bear from his birthday. I was so grateful for the man that created this character that had brought such joy to my son that I emailed him through his website and thanked him. Whoever it was that read his emails sent a quick note back asking for my address and a few weeks later a signed copy of Paddington came in the mail. Michael Bond was old at the time and died less than two years later. I don’t know him personally but his life has touched mine. He used his influence for good. Whoever we can influence with our talents and time let it be for good. A little thing like a signed book might be the thing that offers a ray of light to a family going through a storm. Little things are big things. And yes I plan to see the Paddington movie that comes out this week. And yes even though it’s a comedy I’ll probably cry! What authors have touched your lives? I didn’t know this story and I love it. It brought tears to my eyes. How very special. The author that touched my life (and continues each day still) is Don J. Black. He was also my seminary teacher but when I made some poor choices he advised me and he wrote about me in his book, The Students, My Friends. He also sent me a signed copy because at that time I wasn’t really treating him with the respect I felt for him. Now he sends me emails with thoughts and we right back and forth. He has been such an example in my life and I love him for it–in fact I would say I am the person I am today in large part because of the interest he took and continues to take in my life. Thank you for your story which had me think about life again. That’s a great story! I LOVE it when people use their influence for good. we all have something we can affect for good!